A former coworker described Christopher Wilson Snyder as "unstable" and "obsessed with being a tough guy"
The man who police say went on a fatal shooting spree in a rural Maryland community had a federal license to sell guns and ran a gym geared toward law enforcement officers. A cloudy picture is emerging of Christopher Wilson Snyder, who police say shot and killed three people on Monday after holding his third wife captive over the weekend. Snyder fatally shot himself after an hours-long standoff with police, according to Montgomery County police. Snyder was 41. Snyder ran a gym in Columbia, Maryland, called Code 3 Tactical Academy. The website portrays Snyder as a self-defense expert who trained officers from several Maryland counties, including Montgomery, Prince George's, Howard and Anne Arundel. The Howard County Sheriff's Office says they were never affiliated with Snyder. Montgomery County Police Chief J. Thomas Manger said on Monday that the county’s officers had contact with Snyder a number of times, but did not elaborate on the nature of the contact. Snyder held a federal license to deal guns through an entity called Black Widow Enterprises, which was registered to his Brookeville, Maryland, home. Neighbors told News4 that something felt unusual about the situation in Brookeville. 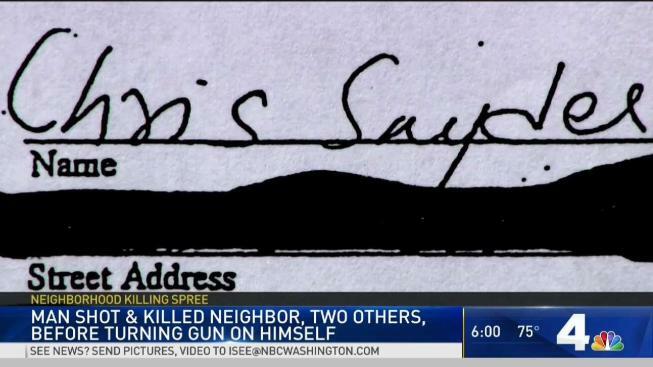 "He was never around," said one neighbor, who asked not to be named. "When you did see him, he really didn’t talk to you." He also operated out of a home in Ellicott City, Maryland. Neighbors there knew him for two things: fancy cars and a large gun safe. Snyder, who appears to have multiple aliases, had moved to seal much of his personal information, including a divorce case. In a court document, Snyder wrote that he was a veteran, worked for the government and held a top-secret clearance. He also claimed he worked on classified operations. But someone who worked with Snyder for six months from 2012 to 2013 told News4 that Snyder left a job after his security clearance went into "delay" status. The man, who asked News4 not to use his name, said Snyder was "obsessed with being a tough guy" and a "con man." He described Snyder as "high strung," "unstable" and "a habitual liar." Snyder was recently arrested for possession of a dangerous weapon and possession of a controlled substance, court records show. Other court documents obtained by News4 were heavily redacted. Snyder is accused of killing Mary Ann Olson, a retired doctor, her house guest, Danny Lee Murphy and a contractor, Craig Harold Shotwell.